I know we have not been posting frequent enough and we are trying to change that. We are all students and our time is easily snatched away from us by school, work and others. Please continue checking and reading our posts. In order to get something out there I thought I would put together a list of a few films that I highly recommend you go out and see if you are not already familiar with them. If you have seen them write in what you think. If you have not, see them and comment on what you thought. I am very interested to hear what others think of these movies. I love old movies so many of these are older and may be unfamiliar to you. See them and comment. Rear Window(1954)– I have mentioned this masterpiece of suspense by Alfred Hitchcock before and it?s always worth mentioning. Hitchcock being the ‘Master of Suspense’ makes this film like he created suspense, both the feeling and the genre. It is one of his best if not the best. Possibly the best part is that it stars Jimmy Stewart and the gorgeous Grace Kelly. Stewart’s character is confined to a wheelchair and his apartment and begins watching his neighbors out of boredom (and he has a great view thanks to an amazing set). Things begin to get suspicious then tense as Stewart’s imagination begins to run, but is there something to it? Hitchcock plays with the natural curiosity that leads us all to be compulsive people watchers and he uses our own imaginations against us. The film is so well shot and Stewart is so talented that we too are carried off in our thoughts and fears. There will be several scenes so tense you won’t be able to decide whether to sit or stand, hold your breath or scream. Jaws(1975)-This is just a great thriller. If you haven’t seen it you must, and the whole thing (I know someone who has not been able to watch past that first scene on the beach). What is great about Jaws is that for most of the film you cannot see the thing you fear; all you hear is that ominous score. That scene with the scars and Robert Shaw telling the story of the U.S.S. Indianapolis is one of my favorite scenes in film. 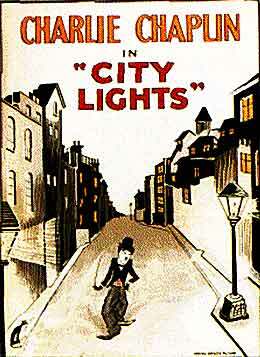 City Lights(1931)– This is a charming, easy to watch and thoroughly pleasant silent film by Charlie Chaplin (probably his best). If you only watch one silent movie make it this one. It’s one of the greatest movies ever made. American Film Institute has it at eleventh place. One of the things that makes it worth seeing is to marvel at how smoothly Chaplin can communicate, develop a plot and appeal to your emotions. The appeal to emotions is what makes silents wonderful. Without dialogue silent films communicated through pathos and emotion. The movie follows the misadventures of the Tramp as he falls in love with a blind flower girl and does all he can to help her. It’s sweet and hilarious. The closing scene is also one of the best ever filmed and is so touching it may bring you to tears. And all without sound, but when you?re Chaplin who needs sound. American Graffiti(1973)– An amazing and important period piece. It is important because it gave George Lucas the means to make STAR WARS. It is Lucas’ record of the American car culture of the ’50s and ’60s. It is set on the last night of summer in a California town (filmed in Lucas’ hometown of Barstow) and has a continuous period soundtrack of Motown and first generation rock-n-roll. If you can watch it without interruption it will cause you to lose yourself in the era. It follows several friends as they prepare to go back to high school and leave home for college. It’s a very entertaining and comic look at ’60s adolescence. It is also notable for strong performances of young soon-to-be stars like Ron Howard, Richard Dreyfuss, Mackenzie Phillips and Harrison Ford. It’s a Wonderful Life(1946)– If you have not already seen this Jimmy Stewart movie you have been deprived of life and Christmas and cannot afford to waste any more time. Words will not do the film justice so just go watch it. Now! Butch Cassidy and the Sundance Kid(1969)– This is a western everyone enjoys. Staring Paul Newman and Robert Redford it was nominated for seven Academy Awards and won four of them. It is funny, exciting and playful. The filming makes the movie beautiful and has a great script. The ‘raindrops’ scene is probably the most enjoyable of the film and has a great song. The African Queen(1951)– One of the (if not the) greatest examples of acting. It stars Humphrey Bogart and Katherine Hepburn at the peak of their careers (and with plenty of experience). They have natural chemistry and give the script new life as it develops into witty comedy. Bogart and Hepburn play Brits who get stuck behind German lines in Africa during World War I. As they make their way up a dangerous and unpredictable river their focus moves from escaping capture to striking an offensive, their relationship humorously developing along the way. Since the movie is set mostly on a small boat with only Bogart and Hepburn aboard their performances are not compromised by lesser co-stars. The other night I saw Disturbia for the first time. When it first came out I was reluctant to see it. Being an Alfred Hitchcock fan and a Jimmy Stewart fan I had always held the strong opinion that Rear Window is one of that elite class of movies of which it should never be remade or ripped off. When I first saw the trailer for Disturbia I was furious and expected some kind of action—exile from the film industry, life in prison, castration… something. As time passed and I heard more about the movie my feelings about the act of heresy became less intense. I appreciated that it was not a complete remake (just the stealing of an original idea) and that it takes a different approach using more scare and horror than suspense (suspense takes more skill). It became less of a sin; maybe ten years would be sufficient. Then I watched it. It was a decent movie, and it was exciting and entertaining to watch. I enjoyed watching it and felt that was the extent of it. 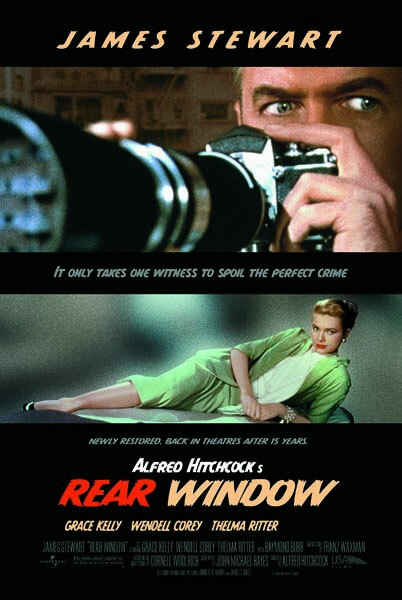 Whatever was clever or original about it is lost with the knowledge of Rear Window. It was a good movie but I was hoping it would be better. They were, after all, standing on the shoulders of Hitchcock. People-watching is captivating and Hitchcock used this to a much greater extent than Disturbia. Disturbia did not allow for as much people watching focusing on the characters within the house doing the watching rather then letting us watch for ourselves. One of the great things about Rear Window is the situation combined with Stewart’s terrific acting. You spend the movie only seeing from his perspective. You see what he sees and then you see the reaction written in his face. That was one of the disappointments about Disturbia, the main character ended up telling you what was going on. I highly suggest watching Rear Window its a masterpiece of film making. If you have not seen either movie be sure to watch Rear Window first so when you see Disturbia you think “this is just like Rear Window” rather than the other way around.